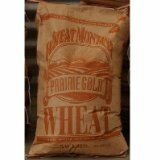 We Carry Wheat Montana, Bronze Chief and Prairie Gold Spring Wheat in 50 pound bags. Bronze Chief and Prairie Gold Spring Wheat Is Certified Chemical-Free, Hi-Protein Wheat. With the hight protein we are sure you will enjoy larger, lighter loaves of fresh baked bread with awesome flavor and improved results in your recipes when you use wheat from Montana.